Psychiatric dogs offer many therapeutic benefits, including alleviating symptoms associated with anxiety, depression, and concerns about going outside or other social interactions. Because they have a wide range of benefits for people struggling with psychiatric disorders, psychiatric service dogs are frequently trained to help. Note – for PTSD, we have a separate page with more info. Service dogs can also help in ways that are not particular to a specific diagnosis. During a manic episode, psychiatric service dogs assist the handler by providing stimulation. This can calm racing thoughts, soothe irritability, and alleviate hyper-focus and hyper-locomotion. Provide companionship while in stores and other environments can reduce stress associated with daily activities. Encourage the handler to be more social by getting him or her out of the house for walks. 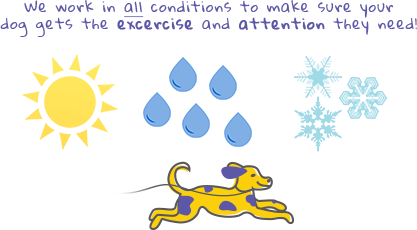 Walks also increase the amount of exercise the handler gets and improves his or her ability to self-sooth if they are struggling with insomnia, or having anxiety issues. Help the handler keep a constant schedule and will be a reason to get out of bed in the morning (walks, relieve themselves). Depression causes the person to focus inward, and interactions with a Service Dog can help the handler focus more on their environment. Rather than thinking and talking about themselves and their problems, they can watch and talk about the dog. Studies show that with a Service Dog, there is often more laughter during an interaction that with any other treatment, thus decreasing isolation. The presence of a Service Dog encourages socialization between the handler and their peers, family, and visitors. For instance, many family members report that it is easier to for people talk to the handler who has a Service Dog, and makes interactions comfortable and pleasant. The tactile experience of touching the dog can be calming, and even when doing everyday tasks, the handler feels less pressure working with the dog than with other people. Less anger and fewer acts of aggression are often the result. Increased mental stimulation occurs with a Service Dog not only because the dog requires time and attention, but because they encourage interaction with the outside world, brightening interactions, and increasing amusement, laughter, and play. The correlation between touch and health is strong, and a Service Dog can help with this element. For instance, when touch from another person is not acceptable, the fuzzy touch of a Service Dog often is, as it is safe, non-threatening, and pleasant. Since people relax more easily when around a Service Dog, tests have shown that the decrease in heart rate and blood pressure can be dramatic. People are often more comfortable talking with their Service Dog than with other people, and this increase in speaking leads to more verbal interactions with other people. By taking care of a Service Dog, people learn to develop nurturing skills, promoting their growth and development. Simply by noticing that their dog is panting, they can learn that the dog is thirsty and can get them water, thus helping form empathy. Sleeping with a warm, fuzzy dog can help their handler go to sleep, and can help reduce night terrors. Since a dog accepts without qualification, not caring how a person looks or what they say, their acceptance is non-judgmental, uncomplicated, forgiving, and unconditional. Self esteem was enhanced significantly, as measured by the Rosenberg Self-Esteem Scale.